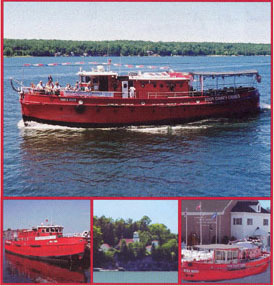 Enjoy the scenic waters of Door County from the comfort of a historic vessel. Each narrated tour lasts 1.5 hours and cruises either along the Sturgeon Bay Ship Canal, or to Sherwood Point Lighthouse (minimum passenger count and weather permitting). The boat is equipped with restrooms. Snacks and refreshments are available for purchase, as well as gifts and memorabilia. We offer a full bar, including liquor, wine and beer. Pets are welcome on a leash. Every day at 10:30am and 12:30pm.